Daily Illuminator: More Awful Green Things! March 8, 2015: More Awful Green Things! That's right, we're reprinting it! 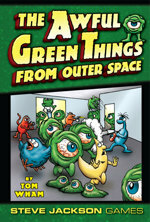 In June, The Awful Green Things from Outer Space gets a reprint, in all its glory.